MKEimages.com Image of the Day - "That's one small step for a man; one giant leap for mankind"..... Neil Armstrong. While our image today is of course not Milwaukee related we would like to commemorate the 40th Anniversary of NASA's first manned mission to the moon, July 20, 1969. Interestingly, this iconic image of Buzz Aldrin taken by Neil Armstrong is a scan of a photo that was printed from the original film negatives that were brought back on Apollo 11. Happy Holidays from the team here at MKEimages.com. Other than having a stock image library of the events, architecture, and lifestyle of Milwaukee, MKEimages.com is available for location, assignment, and product photography. This image taken by MKEimages.com photographer Mark Bertieri was used in an advertisement by Metropawlis featured in the latest edition of KEY Milwaukee Magazine. KEY Milwaukee is the leading visitor guide for Milwaukee and the surrounding counties. MKEimages.com is pleased to announce that many of our images have been published in "Hemispheres", United Airlines in-flight magazine. The images were featured in the magazine's 2008 Insight series. Insight: Milwaukee will be featured on all United and United Express flights for the month of October. 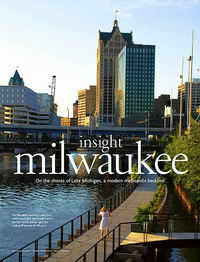 Insight: Milwaukee examines the people, places, history, and industry of Milwaukee and the surrounding areas. It showcases emerging industries, economic development, health care and educational resources, real estate, dining, accommodations, recreation, and quality of life issues. "Hemispheres" is seen monthly by more than six million passengers traveling to over 210 destinations in 26 countries. "Obviously we were pleased when approached by the publisher, Pace Communication, to locate the quality images that they were seeking to produce the publication. Other than using many of our exciting stock images we also performed location shoots of Cory Nettles (Quarles and Brady LLP) and Adam Siegel (executive chef for Bacchus and Bartolotta's Lake Park Bistro). This type of publication is suited to our unique type of Milwaukee imagery and we were very comfortable in working with Pace", says Mark Bertieri, editor of MKEimages.com. MKEimages.com is a stock image agency providing images of the architecture, events, and lifestyle of Milwaukee, WI to the commercial, editorial, and retail publishing communities. Click here to view the complete Insight: Milwaukee publication.